Sidelock - A type of action on a break-open gun where the lockwork (hammer, sear, mainspring etc) is mounted to the back side (inside) of a plate (or pair of plates for a double gun). A sidelock is superior to a boxlock because: 1. Less steel needs be removed from the bar of the action; the action is therefore stronger. 2. The lock plates provide a larger canvas for the engraver's art. 3. Sidelocks have generally been considered a more aesthetically pleasing form. 4. They are often made with secondary, or intercepting, safety sears. 5. Trigger pulls theoretically may be adjusted more precisely. 6. 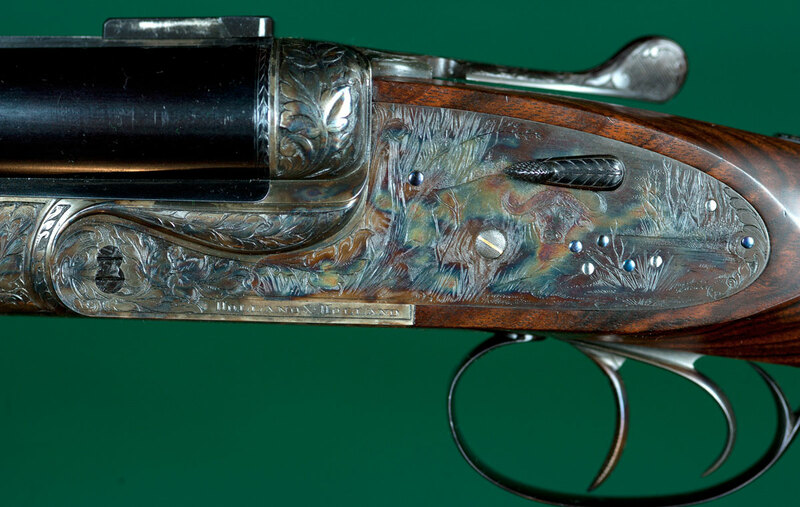 Because of all the above, most makers building a range of guns have usually reserved the sidelock action for their better grades of guns; this last being the most relevant reason why sidelocks are generally considered superior to boxlocks. In this photo the left lockplate is in place; right lockplate is removed to the show internal mechanism. Back-Action Sidelocks removed to show internal mechanism. Note the rearward-facing mainspring. This layout requires less steel to be removed from the bar of the action than does a Bar Action. It is consequently stronger---more suitable for use in double rifles. Purdey Bar Action Sidelock. Note the retaining pin, locating the apex of the leaf spring, protruding through the forward end of the bar of the lock. 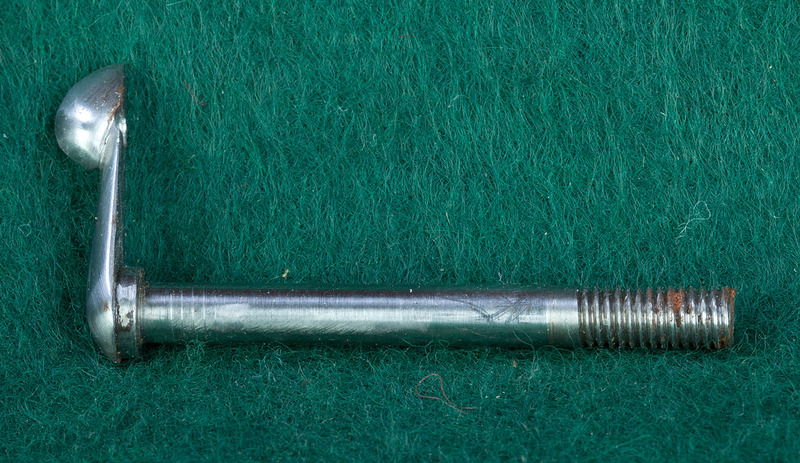 A Holland & Holland-type Bar Action Sidelock removed from a gun. Note that the leaf mainspring runs forward into the bar of the action. Capitalizing on the swivel fitted between the lower hook of the mainspring and the forward arm of the tumbler, this layout allows a faster lock time than with a Boxlock (or back-action sidelock). The swivel allows the direction of force applied to the hammer to change as the hammer falls, maintaining pressure and even increasing it as the mainspring's energy is released. The bar action sidelock can typically be made to look more sleek than a back action sidelock. 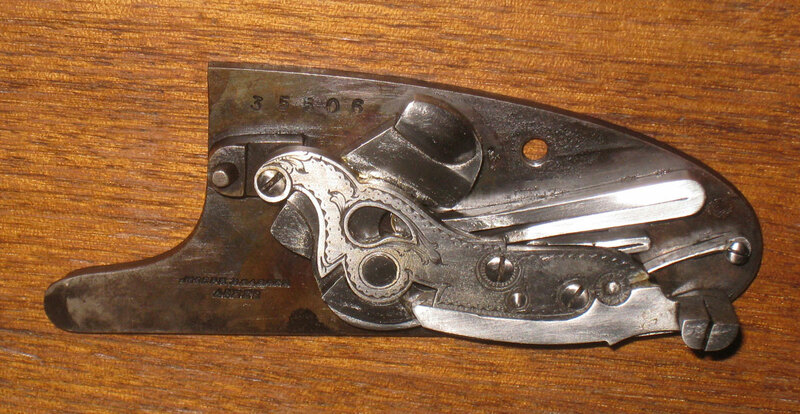 Identified from the exterior by the mainspring locating pin at the forward end of the bar of the lockplate. In operation, upon dropping the barrels, the cocking lever (incorporated in the action body; not shown) pushes up on the hammer's cocking boss (1), which revolves the hammer rearwards about its axle-pin (2), until the main sear (3) catches the hammer's bent (4), holding it in the cocked position, as shown. To fire the gun, a pull on the trigger (incorporated in the action body; not shown) pushes up on the sear bar (5), which pivots the sear (3) downward, out of the hammer's bent (4) and releasing the hammer (6) which, powered by the compressed mainspring (7) is driven forward, striking the firing pin (incorporated in the action body; not shown) which in turn strikes the cartridge's primer, firing the gun. A Holland & Holland Hand-Detachable Sidelock. The hand-removable, crank-headed, crosspin screw cinches both opposing lockplates together into the head of the stock---and may be removed for cleaning and/or inspection without tools. A Hand-Detachable Sidelock with concealed release. In the first photo, a fingernail into the faintly-visible crescent slot on the upper rear of the lockplate pulls open a hinged tab (second photo) which allows the lockplate to be unscrewed without the use of tools. 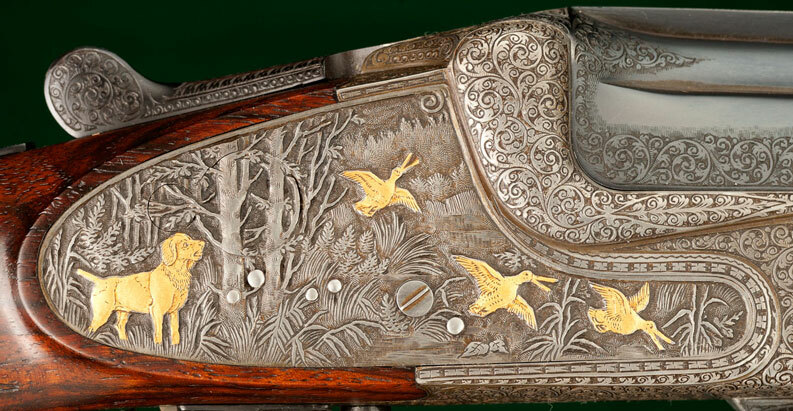 Sideplates - Decorative steel plates mounted to the sides of a boxlock break-open gun, inletted into the receiver and into the wood just behind it, to make the gun resemble a sidelock in appearance and to provide a greater area for engraving. Sideplated guns, usually, can be recognized by the lack of action pins visible in the sideplates (although some sideplated guns are built with fake pins). 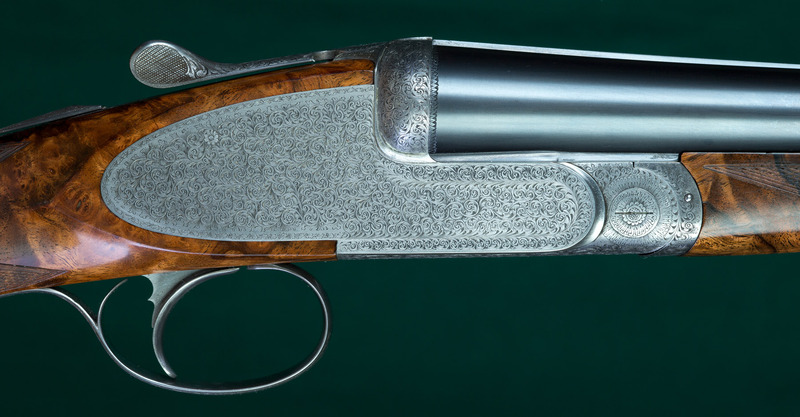 A boxlock, with decorative sideplates to mimick the look of a sidelock. 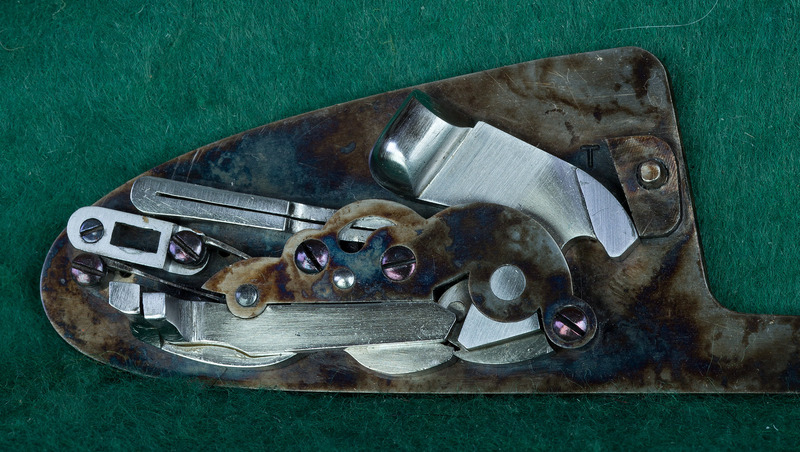 Sidelock actions, usually, can be recognized by the action pins visible on the exterior of the lockplates. A very few sidelock actions, however, are constructed in a demonstration of sublime gunmaking to show no pins through the lockplates. 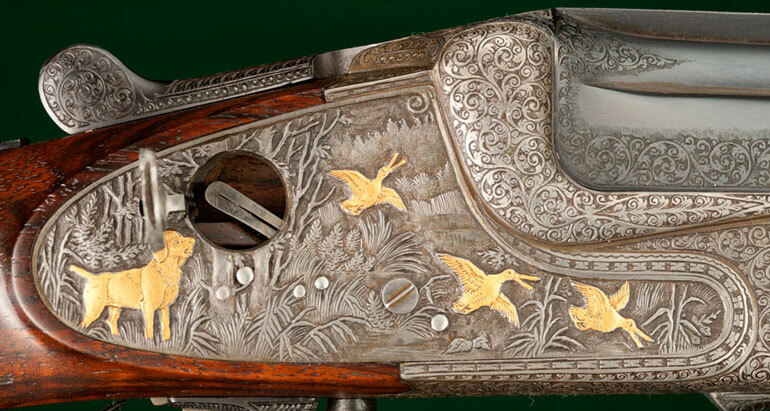 The considerable amount of extra work required is sometimes undertaken on very fine guns to allow a completely un-interrupted canvas for the engraver's art. A sidelock gun built with no pins visible on the exterior of the locks---for a cleaner look; the engraving not being interrupted by pins.